UNIT 2 . 2 Bedroom 2 Bathroom Executive Apartment, recently refurbished throughout, including Corner Spa Bath in Main Bedroom. Spectacular Village, Lake/Ocean views from Lounge/Balcony and Main Bedroom, Modern kitchen with Island bench looking out to Garden Patio at rear. Separate Laundry with washer & dryer.Single undercover carparking. UNIT 17. 1 Queen Bedroom 1 Twin Single Executive Fully self-contained, spacious 2 bedroom, 2 bathroom executive apartment, this Unit has 1 Q Bedroom 1 Twin single Bedroom, includes all linen. With modern amenities, recently renovated throughout Island Bench in kitchen, additional flat screen TV in Kitchen , Great 50 degree Lake/Ocean views from Kitchen and Garden Patio, Lounge/Balcony &Spectacular Panoramic views of the Coastline from Main Bedroom. This Unit is available for 3 or more nights stay upon request. Standard 2 Bedroom 2 Bathroom Apartment, full size kitchen, oven,stove top,micro wave oven, dishwasher full size refrigerator. Separate laundry with washer and dryer, 48" Flat screen H.D. TV, Blueray DVDplayer, iPod docks, undercover car park,great views from lounge/balcony and main bedroom, garden patio at rear kitchen. Great family value. UNIT 6: Standard 2 Bedroom 2 Bathroom fully self contained Apartment, this Unit has 2 Queen Bedrooms inc linen. Tastefully decorated, homestyle accommodation, Rear Kitchen garden patio. Spectacular Village, Lake /Ocean views from the Lounge/Balcony and Main Bedroom. Single undercover parking. UNIT 10: Fully self-contained, spacious 2 bedroom, 2 bathroom Standard apartment including all linen. With modern amenities, this Unit has 1 Queen bedroom 1 Twin Single Bedroom with Spectacular Lake/Ocean views fom Kitchen/Patio, Lounge/Balcony and 180 deg views from Main Bedroom, Single car undercover parking, separate laundry, Balcony off 2nd Bedroom for afternoon sun. 3 or 4 nights by request. UNIT 16. Fully self-contained, spacious 2 bedroom, 2 bathroom Standard apartment including all linen. With modern amenities, renovated Kitchen with Island work bench,recently renovated bathrooms, dishwasher, full oven, microwave and refrigerator, this Unit has 1 Queen bedroom ,1 Twin Single Bedroom, 180 deg Lake/Ocean views fom Main Bedroom, 50deg Views from Lounge/Balcony and kitchen patio, separate laundry with washer and dryer, single undercover carpark. 3 or 4 night stays by request. UNIT 19. Fully self-contained, spacious 2 bedroom, 2 bathroom Standard apartment including all linen. 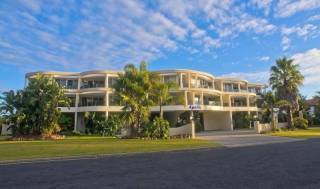 With modern amenities, this Unit has 1 Queen bedroom 1 Twin Single Bedroom with Spectacular Lake/Ocean views fom Lounge/Balcony and 180 deg views from Main Bedroom. Single car undercover parking, separate laundry, Garden patio at rear off Kitchen. 3 or 4 nights by request. Unit 21 : 2 Queen Bedrooms. Fully self-contained, spacious 2 bedroom, 2 bathroom apartment including all linen. With modern amenities and spectacular lake/ocean views. 2 x Queen bedrooms in this apartment.Tastefull decor, homely unit with Great Views from Lounge room, Balcony & Main bedroom, rear patio garden area from Kitchen. Minimum 7 night stay. 3 night stay by request. UNIT 12. Fully self-contained, spacious 2 bedroom, 2 bathroom Standard apartment including all linen. With modern amenities, this Unit has 1 Queen bedroom 1 Twin Single Bedroom with Spectacular Lake/Ocean views fom Kitchen/Patio, Lounge/Balcony and 180 deg views from Main Bedroom. Single car undercover parking, separate laundry, balcony on 2nd Bedroom for afternoon sun. 3 or 4 nights by request. UNIT 15 Fully self-contained, spacious 2 bedroom, 2 bathroom Standard apartment including all linen. With modern amenities, this Unit has 1 Queen bedroom 1 Twin Single Bedroom with Spectacular Lake/Ocean views fom Kitchen/Patio, Lounge/Balcony and 180 deg views from Main Bedroom. Single car undercover parking, separate laundry, balcony on 2nd Bedroom for afternoon sun. 3 or 4 nights by request. UNIT 13. 1 Queen 1 Twin Single Executive Fully self-contained, spacious 2 bedroom, 2 bathroom executive apartment, this Unit has 1 Q Bedroom 1 Twin single Bedroom, includes all linen. With modern amenities, recently renovated throughout, Spectacular Lake/Ocean views from Kitchen and Garden Patio, Lounge/Balcony & Main Bedroom. This Unit is available for 2 or 3 night stays upon request. UNIT 24. A 3 Bedroom 3 Bathroom Executive Apartment with modern amenities includes linen, with Intimate Double Shower in main bedroom, this Unit has 1 Q Bedroom and 2 Twin singles. Fantastic Ocean/Lake Views from Lounge/Balcony & 180 deg views from Main Bedroom, 2nd & 3rd Bewdroom have Garden outlooks and there is a small Garden Patio off Kitchen at rear, Single undercover parking. 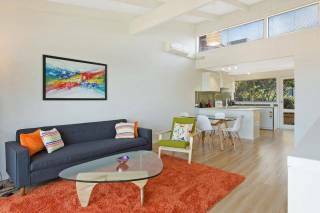 FSC 3 Bedroom 2 Bathroom, Spa Bath, Modern Open Plan Living, Beautifully Decorated, Sensational Village Lake and Ocean Views from Lounge Room and Balcony, Magnificent Glass Dining Setting for 8 people. Flat sceen 32"HD TV, DVDplayer ipod dock, fantastic white leather lounge, this is one of the most sought after units in town. 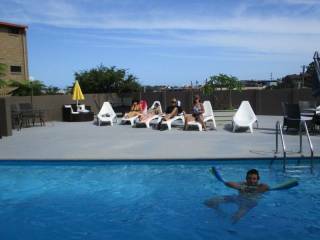 Magnificent heated all year round swimming pool and free stainless steel BBQ's all with unbelievable views. 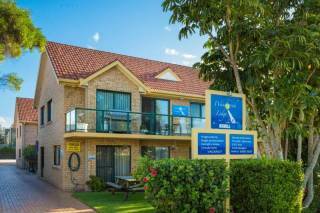 Pacific Heights Apartments Merimbula offers you 18 fully self-contained 2 and 3 bedroom apartments, all bedrooms have separate bathrooms.Pacific Heights enjoys the best views Merimbula has to offer only 500 metres from main shopping area. Munn's Tower House is a beautiful historic house with the charm of yesteryear, suitable for a larger family or for the couple who wants room to move. Fully fenced with private verandas and gardens. Our complex features a 13 metre Heated Swimming Pool heated all year round temp 27c with Elevated Lawn Sunbathing Area overlooking the Village, Lake & Ocean, Free Electric Stainless Steel Barbecues, Undercover Parking, 80cm HD Flat Screen TV's, Free Austar Channels,(No Austar in Munn House) DVD Player, Full size Self Contained Kitchen, Separate Laundry with Washer and Dryer, Garden Patio and Lounge Balcony. Views overlooking Village, Lake & Ocean. PacificHeights looks over Fishpen. A garden patio off each kitchen looks out on landscaped gardens, some with lake and ocean views. A private lounge balcony provides great lake and ocean views, with sensational lake and ocean views from the main bedroom. TV and DVD with Free Austar including movie channels provide the lounge room entertainment, a bar fridge satisfies the sports-minded viewer. All this within walking distance of Merimbula township, where you'll find restaurants and cafes, boutiques and shoe stores, hair and beauty salons, clubs and pubs, a large supermarket open 7 days as well as bakeries, fish shops, sports and fishing stores, toy stores, ice creameries, wholefoods and fruit & vegetable shops. Merimbula has a great variety of beaches and most are a walk or only a few minutes drive away, including Mitchies Jetty at Fishpen, Main Beach, Bar Beach and Short Point. 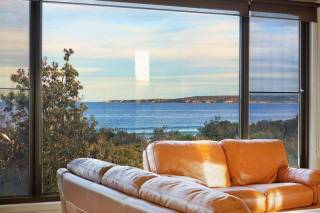 A little further afield are Pambula Beach and Tathra Beach. If you're a golfer, choose from five local golf courses, or tour the local art and craft galleries. Visit the Eden Whale Museum, walk through national parks and state forests, paddle a canoe or take the family to Mandeni Family Fun Park, Magic Mountain, Potoroo Palace or Merimbula Aquarium. We're also very close to the start of the lake boardwalk that leads to Top Lake and Fishpen - where you can catch regular fishing charters and whale watching tours in season. Call us now to arrange your own Special Holiday Break; Whale Watching, Fishing Trips, Private Charters, Golfing Groups all catered for. 30% Deposits must be paid within 14 days of booking to secure booking. Payment may be required 14 days prior to arrival in High Season. Check in time 2pm. Check out time 9.30am. Cancellation Fee of $75 will be deducted before deposit refunded. Deposit will be refunded when Unit is re booked less any loss of tariff. A cleaning Fee of $150 will be charged if a Unit is left in a dirty or untidy state or if evidence of smoking inside unit is determined. High Season & Easter holiday bookings less than 7 Nights by arrangement only. Less than 4 Nights booking by arrangement only. Apartments are not serviced , linen will be changed after 7 days. A starter pack of personal amenities is provided on arrival. Guests are responsible thereafter for any replenishment. 30% Deposits must be paid to secure booking. High Season bookings less than 7 Nights by arrangement only. Cancellation Fee of $75 will be deducted before deposit refund. Refunds may be withheld until Unit is rebooked for the same period.